I love Chinese food but abstained from ordering it for a long time because I felt like it was laden in grease and sodium. I decided it was time to take charge and find a way to make my own version of one of my favorites. This version is not fried, has just a tad of vegetable based oil, and uses reduced sodium soy sauce. This is one of my husband’s favorite recipes and a go-to for me when I cook for a crowd because I know everyone will love it. 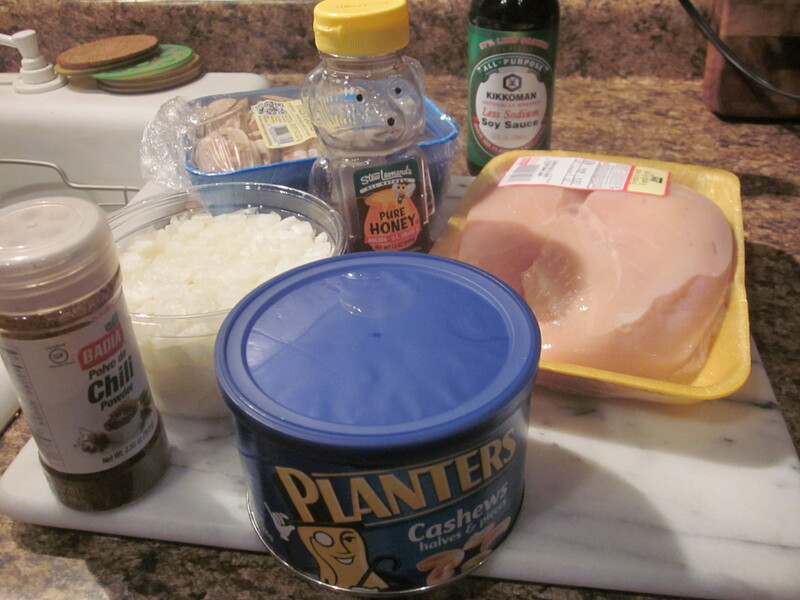 Place cubed chicken in a ziplock with the soy sauce, honey, oil, and chili powder. You can keep it in the fridge for a few hours to marinate or you can simply massage the chicken in the bag to make sure it is fully coated and then get started. Heat a skillet over high heat, the hotter the better. Use tongs and take chicken from ziplock and place on the hot skillet. Keep the reserve marinade for later, don’t toss it. Cook the chicken on one side until the honey starts to give the chicken a nice carmelized crisp. Flip each piece over and repeat. Once the chicken is done on both sides remove it from skillet to a plate and leave aside, keep any remaining sauce in the pan. Add the onion and mushrooms to the skillet and cook on medium high heat, adding the reserved marinade. The marinade needs to come to a boil for a few minutes to ensure that it is ok to eat after having the raw chicken in there. This also gives the marinade some time to thicken. 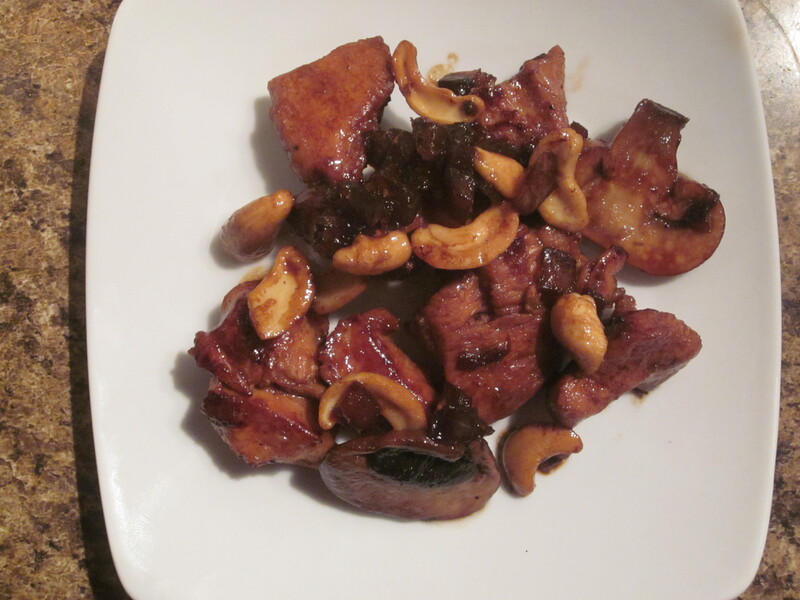 Once the marinade is done boiling, reduce heat to medium and add in the chicken and cashews. Let simmer for a minute or two and then plate. This is tasty over white or brown rice. I often use the easy 90 second microwaveable rice packages when making this dinner. You can also plate it over quinoa for an added healthy protein and source of fiber. If you are making this for your family and they are not fans of mushrooms or onions you can always make this recipe without them or add in a veggie that they prefer. I always encourage some sort of veggie in there, but this recipe can be altered for even the pickiest of eaters. It is worth noting that the onions in this recipe get nice and carmelized in that soy-honey sauce, so many people who aren’t fans of onions will likely not even notice! On a side note, honey is a go to for many runners and athletes. It is an excellent anti-inflammatory. Honey also is a natural sugar whose components aid in glycogen storage, and because it is easy to digest it is great for runners to consume before a long endurance event. I love to have a piece of whole wheat toast with peanut butter and honey in the mornings before I hit the pavement.